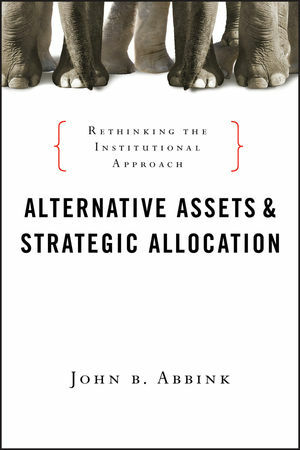 In this much-needed resource, alternative and portfolio management expert John Abbink demonstrates new ways of analyzing and deploying alternative assets and explains the practical application of these techniques. Alternative Assets and Strategic Allocation clearly shows how alternative investments fit into portfolios and the role they play in an investment allocation that includes traditional investments as well. This book also describes innovative methods for valuation as applied to alternatives that previously have been difficult to analyze. Using the information found in this book, you'll have a clearer sense of how to approach investment issues related to alternative assets and discover what it takes to make these products work for you. JOHN B. ABBINK has twenty-nine years' experience in investment firms, including Merrill Lynch, Credit Suisse, and Deutsche Bank, and was formerly a senior vice president and director of manager research at National City Corporation. Abbink received his BA from Michigan State University and his PhD from Yale University.